Maine's attorney general and incoming governor says the appointment of Matthew Whitaker violates the law governing how a vacancy in the office should be filled. Attorney General Janet Mills is supporting a federal lawsuit in Maryland that seeks to block President Trump’s appointment of Matthew Whitaker to serve as acting U.S. attorney general. Janet Mills says that under the law, Matthew Whitaker is not eligible to serve as acting attorney general. Gov.-elect Mills, who will take over for outgoing Republican Gov. 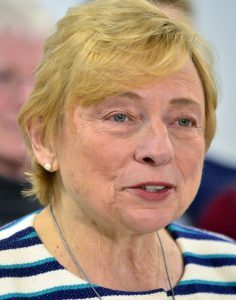 Paul LePage in January, is among a group of attorneys general for 14 states and the District of Columbia – all Democrats – that has filed a brief in support of the lawsuit filed by Maryland Attorney General Brian Frosh, also a Democrat. The lawsuit is challenging the appointment of Whitaker to temporarily take over for Jeff Sessions, arguing that the president has sidestepped the U.S. Constitution and the Justice Department’s own succession plan by appointing Whitaker without a hearing before the U.S. Senate or confirmation vote. Democrats have been calling for Whitaker to recuse himself from overseeing Special Counsel Robert Mueller’s investigation of possible Russian interference in the 2016 U.S. presidential election because of critical comments he has made about the probe and amid concerns over his views on the scope of judicial authority. Sessions’ resignation on Nov. 7 and Whitaker’s appointment have prompted some lawmakers, including Maine Sen. Angus King, an independent, to push for passage of a law that would protect the Mueller probe. But, so far, Republican leaders in the Senate have blocked that effort. Whitaker was Sessions’ chief of staff. In their filing, lawyers in Frosh’s office argue that the job should have gone to Deputy Attorney General Rod Rosenstein instead of Whitaker. They cite a statute governing the line of succession at the Justice Department that says when the attorney general position is vacant, the deputy attorney general may exercise “all the duties of that office.” If neither is available, according to that statute, then the associate attorney general is supposed to be elevated. Beyond that, the lawyers say, the Constitution requires the duties of the attorney general to be carried out only by someone confirmed by the Senate. In addition to Mills, the attorneys general from Connecticut, Delaware, Hawaii, Illinois, Massachusetts, New Mexico, New York, North Carolina, Oregon, Pennsylvania, Rhode Island, Virginia, Washington state and the District of Columbia have signed onto the brief, which was filed Monday in Maryland. 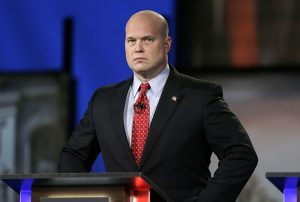 Three U.S. senators, all Democrats, have also filed a lawsuit arguing that Whitaker’s appointment is unconstitutional.